What’s on your mind this week, Southborough? You can add comments to the thread throughout the week. Check back often to see new comments. To view past open discussion threads, click here. 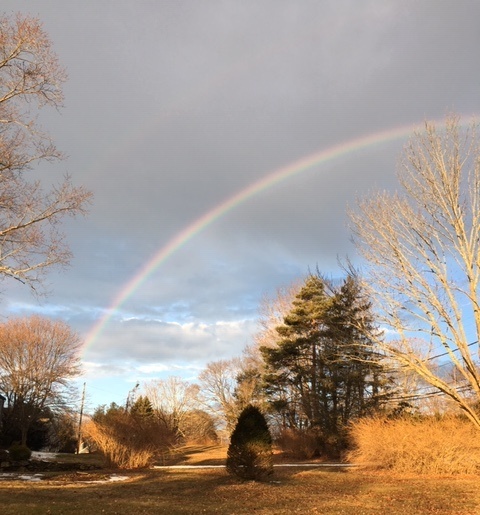 Updated (2/6/19 8:46 am): From what I hear, people spotted the rainbow or double rainbow all over town on Tuesday morning. I’m inserting another contribution (cropped) from reader Claire Reynolds, right. Is the right turn from rt 9 onto Woodland Road ever coming back after they construct the sidewalk? That is a really good photo. A little Photoshop and it would be perfect. Lucky Pilgrim Church gets the pot o’ gold. A little to the left and we all might be getting a tax break. Or the town could use the gold to buy back the old police station and sell it to someone who would convert it to a pub. When is the lower children’s level reopening at the library?